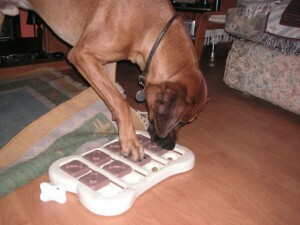 We bought Louis a puzzle game when we were at Crufts. (See Louis at Crufts). Hounds aren’t supposed to be the sharpest tools in the canine shed but when it comes to food then Louis’ brain fires on all one or two cylinders. Here’s a pic of Louis in action solving the puzzle. It doesn’t take him long to get all the treats out and there’s no finesse in his approach. Actually he’s more “gentle” with this puzzle than with his others as he solves those through chucking them up in the air until all the treats have been knocked out. At least with this one he uses his nose and paws. Louis started out on his gold award last night (he doesn’t know this, he just thinks it’s play time). As it was a pre-cursor to the training they had a go at agility; running through tunnels and over jumps etc. Louis took to this really well. We had always planned to see if he liked agility but we were going for his tickets and his good canine citizen’s awards first. He enjoyed it that much I think Sue will see if there’s a more local event that she can take him to one night of the week. He has a more hectic social life than I do. He had the group in stitches at one point last night as he ran in a tunnel and ended up dragging it round after exiting it. Anyway – it’s a bad time of the year for Louis as all the fireworks are going off. He’s fine when outside but if he’s in the house then his strategy is to bark at them. Louis took his Canine Good Citizen Silver test tonight and passed with flying colours. Obviously it’s a gear up from the bronze and this time one of the tests was to walk down the street with the examiner following closely. There were a number of young lads hanging around and they saw Louis and were on about him being a Ridgeback. Sue had to stop to talk to them and she let them say hi to Louis. Fortunately Louis was very well behaved. So – it’s a big well done to Louis but also well done to Sue. I just bask in the reflected glory although I do think my work behind the scenes with Louis has paid dividends! There’s another certificate to frame and another rosette to pin up. Louis’ going for gold next; he doesn’t know it yet and is content to be back home chomping on a pig’s ear.